Forklift License Card, Get Your Forklift Certification Card Today! With so many rules and regulations regarding forklift operators, it’s vital that you and your employees are fully trained and certified to operate forklifts in a safe manner. Not doing so can potentially result in injury, loss of lives and OSHA fines. While many employers find that having their employees obtain a forklift license is time-consuming and a hassle, through CertifyMe.net, employees can quickly and easily earn their forklift license online in as little as one hour. It’s quick, easy, and affordable! What is a Forklift License Card? 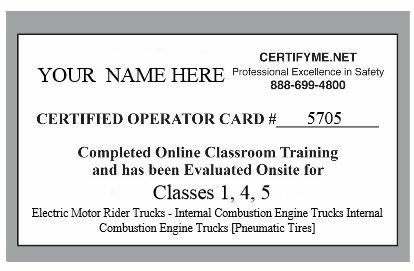 A forklift training card is essentially the official forklift license you receive once you pass both the written online training with CertifyMe.net as well as the in-person practical you do with your trainer. Both of these educational experiences are essential for teaching new operators the ins and outs of operating forklifts, in addition to the safety hazards to look out for and the steps to completing comprehensive inspections. At CertifyMe.net, our training programs will help any employee obtain an OSHA forklift certification card. Check out our courses and pricing information here. Why is Forklift Certification So Important? Like driving an automobile, operating a forklift requires a particular set of skills. And it’s ultimately up to employers to ensure their workers have forklift certification cards. It’s required by OSHA that all forklift workers receive a forklift license card to help prevent accidents in the workplace and make it easier for employers to find the best employees. CertifyMe.net is an affordable, effective alternative to expensive training seminars, off-site training sessions, and more. We’re a great solution for any employer looking to get their forklift operators OSHA forklift certification cards. What Are the Benefits if I Get My Forklift License Card? Beyond the requirements of attaining this level of education, completing a forklift certification and receiving a forklift license can propel you into a better, higher paying career with more responsibilities. Employers will be looking for those with a forklift license, so having one will place you at the top of the job applicant stack. If you want to qualify for a great forklift career and be able to protect your life on the job, you need a forklift training card. What Are the Requirements for a Forklift License? What do I have to do to get my forklift license? At our online forklift school, it’s never been easier to get OSHA forklift certification cards. OSHA requires that all aspiring forklift operators complete certain trainings, and these requirements help to show that the driver is efficient in their safe driving skills and that they have mastered all of the knowledge needed to operate a forklift safely and effectively. Once you have received your OSHA forklift license, you are free to operate the forklift at your business without the worry of receiving any violations. Does a Forklift License Card Expire? How long is your forklift operator card and certificate good for? Typically, three years. However, there are other instances in which an operator would have to renew their card, and not doing so could result in an OSHA penalty or fine. Luckily, with the purchase of forklift training through CertifyMe.net, you will have access to a forklift recertification program for life, adding even more value to our training package. With this single purchase, you will ensure you have OSHA-compliant forklift training forever. If you’re wondering, “How can I get my forklift license?” we’re happy to say that the answer is simple. All you have to do is register on CertifyMe.net for forklift classes. The entire registration process takes ten minutes or less and then you are ready to begin your OSHA forklift certification card training. The training only takes one hour from any device with an internet connection, and the OSHA forklift certification card test takes fifteen minutes. In just over one hour, your employees can receive their forklift training card. This gives you instant proof of your forklift certificate and brings you under compliance immediately. For HR departments, that’s a big bonus – if your company is ever audited by OSHA, they can produce OSHA forklift certification cards right away! Without having to purchase any books or rent a facility for training, we offer the most cost-effective training available. 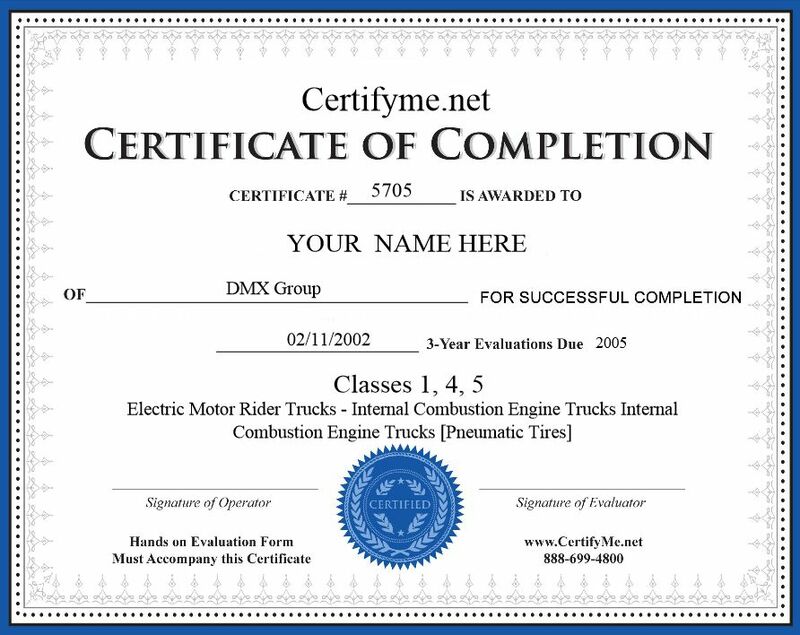 CertifyMe.net is a training leader in the forklift certification card industry. We have training sessions and tests that will give you your forklift certification card in under two hours. With the low price of your training session for your forklift training certificate, you will receive your three-year renewal card at no extra cost. Through CertifyMe.net, thousands of companies have been able to become OSHA compliant, by having all of their employees receive their forklift training certificate. Through their easy program, you can get your certificate and forklift operator card at your own pace, in your own place. View our offered courses and get started today! If you have any questions about a forklift operator certification card, give our OSHA compliance experts a call at 1-888-699-4800. Thanks for visiting CertifyMe.net – we look forward to getting your forklift operator certification cards today!